Jauja is a town in the center of Peru's Junin region. It lies in the mountains and is part of Southern Sierra. The capital of Jauja province lies at an altitude of 3,400 meters and inhabits about 16,000 people. Before the Spanish established Lima as Peru's capital Francisco Pizarro proclaimed Jauja as provisional capital in 1534. The town was famous as a sanctuary for tuberculosis patients due to its favourable dry climate before antibiotics were discovered. 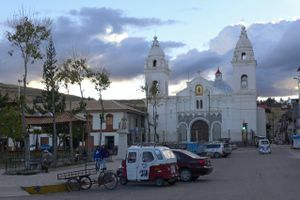 Nowadays Huancayo, the region's capital, has surpassed Jauja as touristic and commercial center. 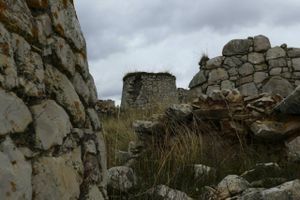 However the small town has its own charms and there are many interesting ruins and sites around the area. Being not very touristy Jauja is an ideal spot to take a break off the Gringo trail - despite sometimes being called Gringo, but always with a smile. Note that Jauja has two different bus stations: the terminal serving Lima and Huancayo bound buses, and Jr. Tarma serving Selva bound ones (Tarma, La Merced and further). From Lima: some buses to Huancayo will pass and stop at Jauja and the trip takes around 6-7 hours. There are many bus companies e.g. ETUSCA has daily buses (8.00 am, 1.00 pm, 11.15/30/45 pm). Depending on bus level the ride costs S/. 25-45.Some buses drop you off a little bit out of town. A taxi to the center will cost 3-5 Soles. From Huancayo: A multitude of buses, colectivos and shared taxis depart daily. Just ask around for the best price. The journey takes about one to two hours. A bus should cost S/. 3.5. From La Selva: Frequent buses, at least every hour during the day, run from La Merced (15 S/. around 3.5 hours) and Tarma (around 1.5 hours). Jauja is the only city in the region hosting an airport with daily flights from and to Lima. Mototaxis within the city will cost about S/. 1.5-2. Shared taxis to Acolla as well as the Laguna de Paca will be S./ 1.5 per person. A private taxi to Tunanmarca village should be S/. 7-10. Jauja Cathedral (Iglesia Matriz de Jauja): Dating from 1564 and being completely restored after a collapse in 1846, this church represents baroque and rococo styles. Within you find finely carved wooden altars, colonial retablos and an image of Our Lady of the Rosary, Jauja's patron. Capilla Cristo Pobre: Gothic church which is patterned after Notre Dame and displays Via Crucis's paintings. In order to visit the interior you will have to ask at the Daughters of Charity/College of San Vincente the Paul. 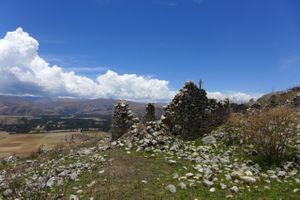 Tunanmarca ruins are one of the best preserved structures of the Xauxa culture which thrived in this region before the Incas. The site served as a living town and you can still recognize the outer walls, family compounds with a central plaza and some well preserved houses. Take a taxi from Jauja to Tunanmarca (the town is also called Concho) shortly after Acolla (S/. 8-10), or walk from Acolla to Tunanmarca in about half an hour. There is a small museum open Tuesdays, Saturdays and Sundays from 9.00 am to 1.00 pm. Entry is S/. 1 and Chasqui the guide will happily show you around. Expect to walk about 1,5 hours to the ruins on the hill through a beautiful agricultural landscape. Alternatively you can take a direct taxi to the ruins which will save you about an hour walk, but you will still have to hike about 15 minutes to the compound. Pueblo Viejo ruins are situated on a hill just outside Jauja. Taxi drivers know where the trek starts and can drop you off. Its a short but a little steep path leading up from the middle of the main road. The ruins are not as well preserved as Tunanmarca but you can still recognise some compounds in the lower parts. The natural earthen eroded towers you can see north are called Pichiluli. You can see Laguna de Paca and the surroundings from up there. You can walk from the ruins to the Laguna, however there is no marked path and you will have to cross some fields and will get out at a small cemetery. Laguna de Paca lies just outside the north of Jauja and is quite a big navigable lake with an abundance of restaurants all lining up at the beginning of the lake. They serve tasty, fresh trouts (expect to pay 10-15 S/.) and offer boat rides. Swimming is not allowed although you can spot some local kids having fun in the water. You can take a mototaxi there for about S/. 3 or walk down from Pueblo Viejo ruins. Further down the lake there is a very small run down Parque Ecologico de Paca with various animal statues and flowers. A visit will hardly take you more than 10 minutes so ask your driver to wait for you. Geocaching : A local environmental organization, the Yanamarca Valley Watershed Committee, has designed a "GeoTour" consisting of 44 geocaches located throughout the Yanamarca Valley (just to the northwest of the city of Jauja), taking visitors on a 3-4 day hunt through rural communities, scenic hills, and several archaeological sites. A local guide is useful but certainly not required (the guide called Chasqui mentioned above is recommended); however, many of the caches are remote and may require hiring a taxi depending on willingness to walk long distances. Sunday's and Wednesday's markets enable you to purchase local products at low prices. Get local handicrafts and clothing in shops all around the center of town. The region hosts very colorful (agricultural) festivals and the masks used there are available for purchase. El Meson (Pollios y Parillas), Av. Ricardo Palma 140 (near the bus terminal), serves grilled chicken and meat variations in a clean and friendly environment. Main dishes include salad and fries. From S/. 6-15. Mario's Cafe, Jr. Junin (close to the Plaza de Armas), nice little cafe which serves good and cheap coffee and yummy cakes, sweets and sandwiches. 2-6 S/. for a snack and a drink. There are many bakeries around town serving local dulces and rich cakes. Close to the bus terminal (Av. Ricardo Palma) street vendors offer different types of cheap food all day long. Around town, e.g. near the bus terminal you find pool halls with bars attached. There are many hospedajes and hostals spread around the city. Most will charge between S/. 40-50 for a matrimonial or double room. Unfortunately almost none of them have WIFI, but Internet shops (ask for Internet cabinas) all over town charge only S/. 1 per hour. El Ganso de Oro, Av. Ricardo Palma (opposite the bus terminal), not the newest or cleanest rooms in town but this hospedaje offers basic rooms with private toilets (hot showers are shared) and is a good budget choice. Some rooms have very soft matresses other hard ones, be sure to try them out before taking a room. S/. 20-30 for a double. Hospedaje El Rinconcito, Jr. Salaverry 861, Tel. 362-866, this hospedaje claims to have a cafeteria, Internet and Wifi. Hospedaje Acuarius, Av. Ricardo Palma 144, it's a relatively new and clean hospedaje which has various room types including two big family rooms (up to 4 people) with WIFI. The family rooms are S/. 70-80, while others might be cheaper and there is a chance to get discounts during weekdays. Mosoj Pacha, town of Acolla, one block north from the Plaza de Armas. An attractive budget option for those looking for a quiet stay in a traditional house outside of the city. This small hospedaje is also the home of Chasqui, a local guide and artist. Accommodations are simple (the toilet is just a hole in the ground), but the house is comfortable and beautifully designed, and you have full access to the kitchen. S/. 15 per night (December 2016). Tourist information (only Spanish) is available from the Municipalidad building at Plaza de Armas on weekdays from 8.00 am to 4.00 pm (they have an hour lunch break). Just ask the receptionist to point you to the right office. Acolla - A small, tranquil town of adobe houses set among traditional family farms. 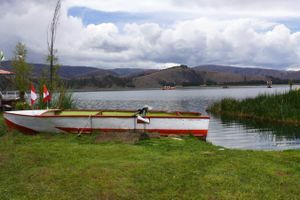 You can use the town as a base for hikes into the lovely hills surrounding the town or to the small lakes Laguna de Paca and Laguna Tragadero, as well as the nearby archaeological sites of Tunanmarca and Pueblo Viejo. The local artist and guide "Chasqui" offers accommodation for S/. 15 a night in his quaint house, "Mosoj Pacha," one block north of the Plaza de Armas; he can be contacted at 964941687. Acolla is located about 10-15 minutes northwest of Jauja, along the road to Tarma. Colectivos from Jauja cost S/. 1.5. This page was last edited on 29 January 2017, at 21:19.